The Christian faith is not about ideas – it is about things that are. As such, we do not need to cultivate theological systems – we need to know how to live. This also tells us something about darkness. The dangers we face are not found in mistaken ideas – they are found in the negation of what is. Scripture says that our adversary was a “murderer from the beginning.” It is existence that he hates, though he does not have the power to cause anything to cease to be. It is God alone who brings us into existence and God alone who sustains all things. And yet, we encounter darkness. I have seen two kinds of darkness (surely there are more). One is the darkness that resembles despair. I have both seen this in others and walked there myself. It is a darkness that is easy to pity and towards which mercy comes swiftly. Despair can take you to the brink and beyond, but it is not poisonous. The second kind of darkness bears almost no similarity to the first. C.S. Lewis captured a picture of this darkness in his novel, Perelandra. 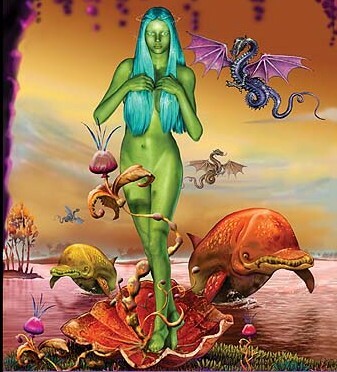 There the “Unman” (Satan using a dead man’s body) pursues an opportunity to cause a second planet to “fall.” There is a great dialog in which the Unman engages Perelandra’s Eve. But it is in less grand settings that the darkness reveals itself. As the hero, Ransom, follows the Unman’s trail, he finds small acts of cruelty, a frog needlessly tortured and left to die; then another and another…. These petty acts of meanness point to a deeper darkness that is simply marked by hatred. …He told himself that a creature of that kind [the frog] probably had very little sensation. But it did not much mend matters. It was not pity for pain that had suddenly changed the rhythm of his heart-beats. The thing was an intolerable obscenity which afflicted him with shame. It would have been better, or so he thought at that moment, for the whole universe never to have existed than for this one thing to have happened…. The energy of hatred is black. The real thing (and I’ve seen it – if you’ve strayed to the wrong places on the internet – even the ‘Orthodox’ internet – then you’ve seen it, too) is a vapid darkness that steals the breath. It cannot be engaged without staining everything it contacts. It bathes in shame and spews it forth. To acknowledge its very existence is to risk a kind of damnation (from which Christ rescues us). It is hard to imagine this darkness as having a human face, but it often does. I understand the tragedy and the pain of despair. There are those who imagine suicide as the worst of sins, but it is as nothing in the face of the mercy of God. I do not hesitate to pray with confidence for such souls, for though the pain of their darkness was dark to them, “the darkness and the light are both alike to [God]” (Psalm 139:12). I do not understand the second kind of darkness and do not know how to enter such a place in order to bring someone out. I believe that Christ does so, and that He knows both the path of entry and creates the way of exit. The souls who have embraced such darkness are not beyond the mercy and kindness of God ( “for He is kind to the unthankful and evil” – Luke 6:35). I believe this to be so because I trust in the kindness of God. But I do not understand it. I believe in the goodness of God. The darkness of evil is not anything. It is not a creation of God; it has no being. It is a direction and a movement away from goodness and being. In most cases it is a stumbling and a falling away. It is only in rare instances that it becomes a willing force that pushes away all goodness and despises existence itself (not its own so much as that of others). This malevolence (literally “evil willing”) is described as a “mystery” in 2Thess. 2:7. God will destroy it. It is because the Christian faith is about things that are and not theories and ideas, that I often resist various theologies that are grounded in concepts of justice. Though justice makes an attempt to address the problem of evil, it only compounds matters, offering little more than a theoretical need for evil to suffer yet more. Justice is used as well in an attempt to describe Christ’s atonement. But in such models, evil presents a need for balance and payment, when the true existential crisis is the need for rescue and for evil’s destruction. Humanity has no need for such justice. God has no needs. In the book of Acts, it is recorded that God gave St. Paul a ministry for us: ” to open their eyes, in order to turn them from darkness to light, and from the power of Satan to God, that they may receive forgiveness of sins and an inheritance among those who are sanctified by faith in Me” (26:18). God give us light and destroy the works of darkness. Written with prayers for the servant of God, Aaron Kimel. May his memory be eternal! The Exapostelarian for the Matins of Good Friday is the hymn, “The Wise Thief.” It draws our attention to the mercy of God – who promised paradise to the wise thief, “This day.” Thoughts on the nearness of paradise are also a theme in the writings of Dostoevsky. If paradise is so near – why do we settle for less? During Holy Week, one of my favorite hymns in the Church is the Wise Thief (the Exapostelarion of Holy Friday). It recalls the thief, crucified on Christ’s right hand, who repents and finds paradise “in a single moment.” It demonstrates the fullness of God’s love who would take the repentance of a single moment and transform it into life eternal. By the wood of Thy Cross illumine me as well, and save me. I often think of this hymn because I also believe that we generally stand but a single moment from paradise, even when we find ourselves tempted and filled with every other sort of thought. We stand but a single moment from paradise, for the same crucified Lord stands beside us. Either we rail at him with the other thief (though the one whom I rail at may not look like Christ, but only one of the least of His brethren). And while I rail, paradise stands beside me, even urging me towards that heavenly goal with the words, “I thirst.” It is for our love and repentance that He thirsts – He who endured so much for the love of man. Another moving example of such repentance is found in Dostoevsky’s The Brothers Karamazov. I have printed this excerpt before, and doubtless will again. It is the story of the Elder Zossima’s brother, Markel, who found paradise in a very short moment as he approached his death. For he says, “At the acceptable time I have listened to you, and helped you on the day of salvation.” Behold, now is the acceptable time; behold, now is the day of salvation (2 Cor. 5:2). 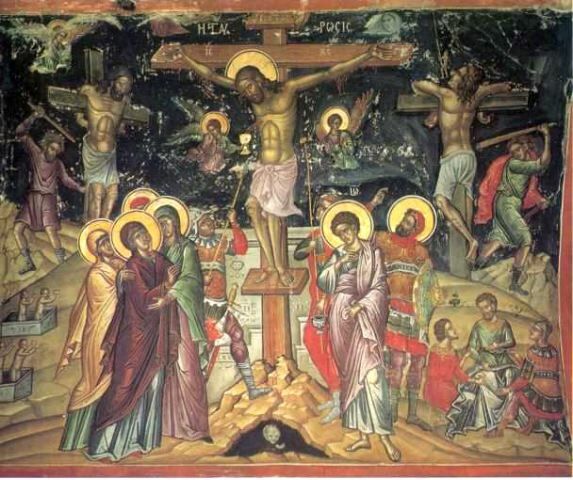 Orthodox and Western calendars rarely coincide on the question of the date of Pascha (Easter). They work with different numbers and come up with different answers. Thus it is that the common pattern obtains this year: Pascha one week apart. 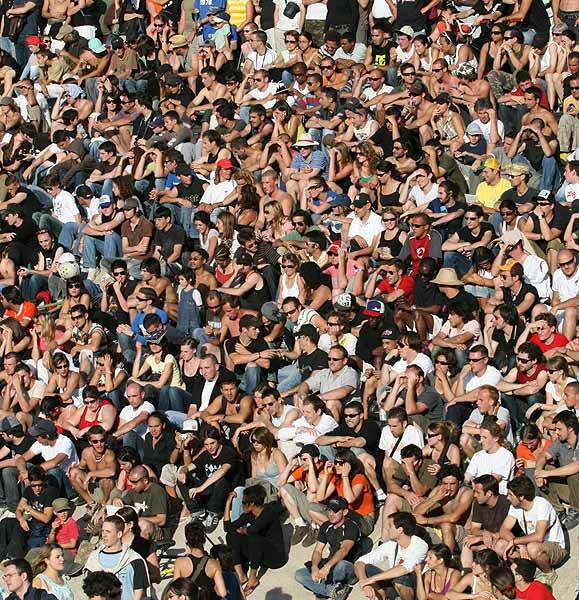 It is possible as an Orthodox Christian to ignore the world around you and pretend that the majority of Christians are not marking Good Friday today or that their Easter will come this Sunday. Admittedly, it can be hard to hold such things together. Besides, the cycle of services leading to Pascha begins tonight for Orthodox parishes. But if we complain about things in the surrounding culture, it should not be a complaint about others celebrating our Lord’s death and resurrection. Would that the whole world stopped and gave those events their proper recognition. The death and resurrection of Christ are not entirely matters of calendar. How can the beginning of all things be held by a calendar? It holds the calendar and all calendars. On what day do we not remember that Christ tramples down death by death? 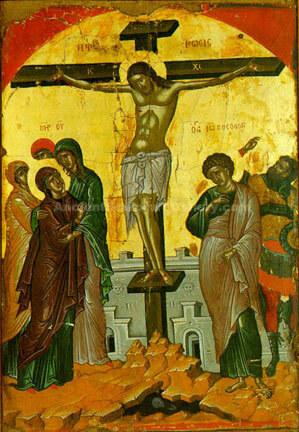 Even on Pascha itself, we never forget the Cross – for the Cross properly belongs to Pascha. Some of my readers have noted that I write in a fairly “existential” tone on the events of Christ suffering, death and resurrection. It’s not an invention of mine, but rather my discipleship to the lives and works of many modern saints and ascetics of the Church: Fr. Sophrony Sakharov; St. Silouan of Mt. Athos, et al. I believe it is the effective word to our generation (as St. Silouan believed as well). We have struggled for too long as Christians under the yoke of moralism, in which everything of Christ’s is interpreted in moralistic terms – geared only towards our legal admission into heaven. This moralism is a caricature of true Christianity. Were the impacts of Christ’s victory on our existence to be forgotten – the faith would be in danger of its own death. If moralism disappears – it will doubtless be replaced by another. Moralism is simple, useful for judging others, and plays well in a world dominated by its neurotic psychological fantasies. But this is a day of great good news. For all of you who are sitting in hell (I reckon myself among your number on many days and only flee there because I am afraid to stay and pray for us all) Christ is coming to break down the doors and reveal the brightness of His resurrection. Last September I sat in the tomb of Lazarus. My ears strained to hear the echo of the cry, “Come forth.” For the day is coming and now is when the dead shall hear the voice of the Son of God… Me we all hear His voice this year and every day of this year. May we be brought from the grave of our sins and into the glorious company of the saints in Light. I am both opposed to theological systems that have at their heart an angry, wrathful God whose justice much be satisfied – but I am also understanding of those who, having been raised or nurtured in pious settings, take theHoly Scriptures pretty much at face value and are thus discomfited by people like myself who seek to give an account of God that does not include God angrily and wrathfully punishing the deserving (even though He does this in a “loving manner”). Some of the contradiction between the God of love and the God of wrath first struck me at age 13 – and occasioned my first rejection of Christianity. I know from personal experience that these wrathful/loving accounts of God have their theological casualities. I am also aware of attempts to treat the wrathful image under the rubrics of a “Semitic” approach to God. Some of which come from Orthodox sources. However, I find that Semitic witnesses such as St. Isaac of Syria were not nearly so dominated by a so-called “Semitic” understanding. God is good, dispassionate, and immutable. Now someone who thinks it reasonable and true to affirm that God does not change, may well ask how, in that case, it is possible to speak of God as rejoicing over those who are good and showing mercy to those who honor Him, and as turning away from the wicked and being angry with sinners. To this it must be answered that God neither rejoices nor grows angry, for to rejoice and to be offended are passions; nor is He won over by the gifts of those who honor Him, for that would mean He is swayed by pleasure. It is not right that the Divinity feel pleasure or displeasure from human conditions. He is good, and He only bestows blessings and never does harm, remaining always the same. We men, on the other hand, if we remain good through resembling God, are united to Him, but if we become evil through not resembling God, we are separated from Him. By living in holiness we cleave to God; but by becoming wicked we make Him our enemy. It is not that He grows angry with us in an arbitrary way, but it is our own sins that prevent God from shining within us and expose us to demons who torture us. And if through prayer and acts of compassion we gain release from our sins, this does not mean that we have won God over and made Him to change, but that through our actions and our turning to the Divinity, we have cured our wickedness and so once more have enjoyment of God’s goodness. Thus to say that God turns away from the wicked is like saying that the sun hides itself from the blind. I understand the care many have to give proper weight to the words of Scripture, and in their experience have only found enemies of the Scriptures who ever suggest alternatives to a more-or-less literal reading. But the sources I quote are great among the Fathers of the Church. My concern as a brother Christian turns towards my heart and the hearts of others. I understand the intellectual satisfaction found in justice – but I do not find its place within the goodness of the heart. I cannot rejoice in the anger of God nor of anyone else. I weep – or more accurately – when I find that I rejoice in the anger of anyone it should be a cause for weeping. For I am a sinful man and I rejoice at things that should cause my heart to weep – so great is the darkness within it. The Orthodox understanding of the wrath of God is not an endorsement of universalism. God alone knows who is saved. But it is a call for universal love. For there is nowhere (certainly within the New Testament) that we are commanded to hate. We are to love our enemies. And if that is to be anything more than lip-service then it must first be modeled in the Good God and grafted within us by His grace. Strangely, I find our century (and the ones preceding it) not overburdened with love, but rather riddled with those who believe their hatreds to be justified. God save me from the man who believes Himself just. I do not stand a chance before him. Rather, number me with the harlots and the publicans – number me with the worst of sinners. Within that refuse of humanity I may find mercy and a heart kind enough to pray for a man as wicked as myself. A number of you will remember this post from a year ago. It is foundational to many discussions on this site. I thought it might be helpful to post again – after all – new readers are always coming on board. The original article (which follows) was published in August (not long ago). However, questions that continue to arise tell me that I need to publish it yet again. I will here emphasize its connection with the Atonement. Theories of legal indebtedness as the problem of sin are certainly popular in some circles of the Christian faith – though they do an extremely poor job of giving a proper account of the largest portion of Scripture on the point. St. Gregory Nazianzus was not unfamiliar with the image, but dismissed it as repugnant in the extreme. He is not a minor, isolated father of the Church, but one of the primary architects of the Ancient Church’s statement of the doctrine of the Trinity. He cannot simply be dismissed as “odd” on this point. Scripture, both in St. Paul and St. John, make the strongest possible connection between sin and death. Our sin is not the result of an indebtedness, but rather the failure to live in communion with God. Humanity did not incur an unpayable debt at the Fall, but rather entered the realm of death (as God had warned). Theories of the Atonement which found their popularization in the Middle Ages in the West and more recently in the Protestant world, should not be allowed to set aside the ancient inheritance of the teachings of the fathers. We are a walking existential crisis – verging on non-existence itself. This is not a result of God’s wrath, but the result of our rebellion against the “good God who loves mankind” and our preference for death over life. I can think of nothing more central to the Orthodox faith, which is to say, the faith as delivered to the Church by Christ. May God give us grace to apprehend the wonder of His gift of salvation.